Calculations at a crossed rectangle. 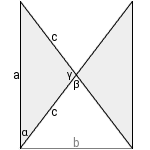 This is a rectangle with two adjacent vertices swapped. It consists of two identical isosceles triangles. Enter the two side lengths of the original rectangle. Choose the number of decimal places, then click Calculate. Angles are calculated and displayed in degrees, here you can convert angle units.